Made from a Genuine Smithfield Ham, this extraordinary bone-in ham gets its rich mellow flavor from a secret brown sugar seasoning mixture developed by Smithfield associate, Mr. Charles Henry Gray. Pre-sliced and ready to heat, this ham is an easy party-pleaser and makes an impressive presentation on your table. And don't forget to keep the bone for added flavor in your beans, soups or stews. 13-16 lbs. Serves about 30. Cured with Salt and Sodium Nitrate, Rubbed with Sugar, Spices, Corn Starch, Dextrose, Natural and Artificial Flavors. Serv. Size: 2 oz(56g), Amount Per Serving: Calories 120, Fat Cal. 40, Total Fat 4.5g (7% DV), Sat. Fat 2g (10% DV) Trans Fat 0g, Cholesterol 50mg (17% DV), Sodium 1720mg (72% DV), Total Carb. 4g (1% DV), Dietary Fiber 1g (4%DV), Sugars 4g, Protein 16g, Vitamin A (0% DV), Vitamin C (0% DV), Calcium (0% DV), Iron (4% DV). Your ham will ship frozen in a sturdy corrugated gift box. Because of the unique salt curing process, ice packs or dry ice are not required for shipment. Partial thawing will occur in transit. Please refrigerate upon receipt. Allow approximately 5 hours per pound to thaw in the refrigerator. Charles Henry Gray Hams may be kept frozen unopened for up to 6 months, refrigerated unopened for up to 6 weeks, or opened and tightly wrapped for up to 10 days, and still maintain maximum flavor. 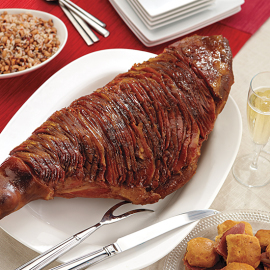 After opening, tightly wrapped ham (do not use aluminum foil) may also be frozen, off the bone. Your ham is fully cooked. However, gentle heating is required to melt and distribute the coating between the slices. Carefully wrap ham in aluminum foil. Heat foil-wrapped ham in a 250°F oven for 2-3 hours OR until coating melts. Serve hot. 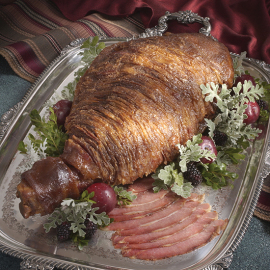 This ham is pre-glazed and seasoned using Mr. Charles Henry Gray's personal recipe. No further glazing or seasoning is recommended. 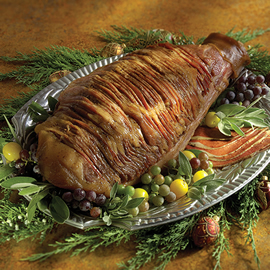 The Charles Henry Gray Ham is pre-sliced along the top in party-size slices. For smaller serving pieces (to fit biscuit size) make several cuts across the slices to your desired size, horizontally with the length of the ham. The underside of the ham is not pre-sliced, so after the party we suggest using the remaining ham for other recipes. Just cut into chunks along both sides of the center bone. Don't let any of this delicious ham go to waste! Be sure to keep the bone and remaining meat for seasoning. Best served as a party ham or as the focus of a buffet. Perfect for biscuits, or chopped for salads and omelets. Use the bone and leftovers to season soups, beans, or vegetables. Delicious for breakfast, lunch, or dinner. This ham will be the talk of any occasion! This ham is the best ham a shopper can purchase. This ham is always the talk of a dinner event. I tasted this ham when visiting Smithfield Virginia years ago and have never forgotten the mouth-watering smell and taste. I've ordered one for this year's family Christmas and I can't wait to hear the raves from my brothers and their wives. This ham is the best of what Southern charm hospitality represents! You will love it! I've been a Smithfield Ham fan all of my life; I'm 78, Virginia-born, but living in NYC. While a lifelong Smithfield ham fan. Your Charles Henry ham blew me away, and I've been ordering the slices for years. Now, however, they're no listed/shown in your catalog. Are they still available. The whole ham is too much for my wife and myself, and the Charles Henry Gray slices are nearly perfect. Owner Response: Thank you for your kind words Mr. Wright! The Charles Henry Gray Party Slices are not in our catalog this year, but you can still purchase them on our website while supplies last. They are Item #2781. You can order online, or give us a call at 1-888-741-2221 to place your order. Thanks again from your friends at Smithfield Marketplace! For 15 Years - Only Henry Gray! For over 15 years Smithfield's Henry Gray Ham has been the only ham to sit on my Thanksgiving dinner. Collard greens, dressing, turkey, candid yams, giblet gravy, fresh green beans, cranberry sauce and Smithfield's Henry Gray Ham -- the only way to eat on Thanksgiving! I am a traditional Smithfield consumer from 2 generations ... We've soaked and slow cooked over night for decades using my father George Archer's recipe. My wife and I decided last Holiday season to get the CHG fully cooked Smithfield Ham....I tell ya it's the best tastin Dam Ham I've eaten in all my years and plan to get another this season. Mr Grey, Smithfield , a lesson in perfection. I have always loved cured ham. I heard the name "Smithfield" from my grandmother throughout my childhood - she wouldn't bother with any other brand. This is one of the best examples of "You get what you pay for" I've ever seen (tasted)! Served this last Christmas, and it completely stole the dinner conversation - and everyone fought over the leftovers (even the bone)! Go ahead . . . LIVE A LITTLE! I was given a gift pack with the Charles Henry Gray Ham a couple years ago. I had always heard of this ham, but had no idea that the rave reviews were actually more under-rated than I could have ever imagined. This is by far the best ham in the nation, maybe in the world. I wanted to buy some slices myself, but was again very pleasantly surprised to get another gift pack of the same delicious CHG ham. What a legacy Mr. Gray left behind, when he left this recipe to be truly enjoyed for centuries to come. We wait all year for this! We order this ham every year for Christmas! My 18 year old son, the oldest of our four children, INSISTS that we get one every year! We serve it at a party for 25-30 people and have plenty left over for the week. DELICIOUS! Ham is not one of my favorites but we didn't have one for Thanksgiving and I thought we should have one for Christmas. This ham was such a big hit! Even I enjoyed it. It was beautiful and delicious! I wish the bone had been cracked so it could have been broken, saved and used for soup or something else good. My son presented a Charles Henry Gray to me for a gift at Christmas. We served it at a large family gathering New Years Day. The ham was wonderful and enjoyed by all. Of particular interest to me is the heritage aspect of this ham, quite unlike the modern product of today. Certainly an experience I would recommend! This is the most amazing ham ever! We purchase one every year for Christmas. I purchased a whole CHG ham for our MOM's 90th birthday, served at a reception for about 100 persons, also served shrimp, beef, BBQ, but the talk for a whole year has been the CHARLES HENRY GRAY HAM by everyone!!!!!!!!!!!! Purchased this ham a few years ago for the holidays. When I finally tasted this ham I was truely amazed. The first bite reminded me of Christmas. Absolutely incredible.